The Lotus Evora just got better! It’s been a busy year for Lotus; the arrival of the acclaimed Exige S; featured marque at the Goodwood Festival of Speed; a new flagship retail store in Regent Street; third place in the F1 Drivers’ Championship and fourth in the F1 Constructors’ Championship; and amongst various racing exploits, another series win for a Lotus with an Evora GTC taking the MSA British Endurance Championship. 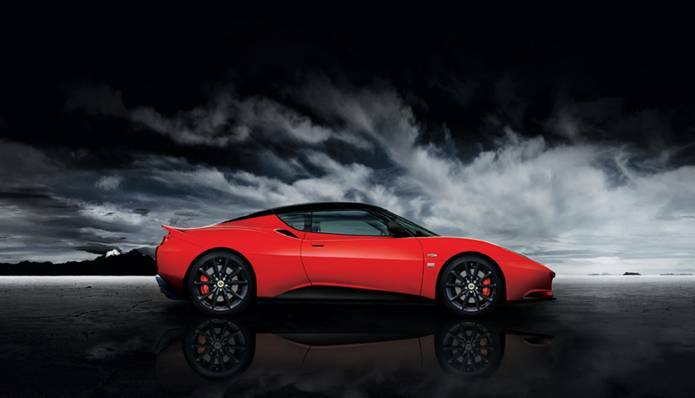 Following the excitement of this race series win, the new Evora ‘Sports Racer’ is a visually enhanced and optimised version of the mid-engined 3.5 litre V6 sports car, available in both naturally-aspirated or supercharged variants. The Evora ‘Sports Racer’ proves its value on the pocket, as well as on the road and track – it delivers phenomenal performance, exclusive style, incredible excitement and genuine affordability! The Evora ‘Sports Racer’ is available in a choice of four colours: Aspen White, Carbon Grey, Nightfall Blue and Ardent Red. To stand out from the crowd, the ‘Sports Racer’ receives unique contrasting accents of gloss black across the roof, front splitter, rear diffuser and side sills, exaggerating the Evora’s aggressive stance and sleek silhouette. Further black elements include black rear badging, black door mirror pods and gloss black forged wheels with a choice of either red or black brake calipers which all work to give the ‘Sports Racer’ a more dramatic and focused appearance. Inside, the 2+2 seating option is standard and comes adorned with black leather ‘Premium Sports’ seats trimmed with red contrast piping and stitching. The dash, doors and centre console receive a liberal dose of Slate Grey SuedeTexTM with red contrast stitching, highlighting the car’s sporting character. Like your interiors a bit louder? Go for Venom Red leather ‘Premium Sports’ seats with black contrast piping and stitching. All Evora ‘Sport Racer’ interiors are complemented by gunmetal dashboard panels, as is standard in the Evora S.
The Evora ‘Sports Racer’ comes loaded with optional extras as standard. The ‘Sports Pack’ provides switchable sports mode with sharper throttle response, increased rpm limit and sportier setting for Dynamic Performance Management (DPM), sports diffuser and cross-drilled brake discs. The ‘Tech Pack’ provides upgraded speakers and stereo system, DVD player, 7″ WVGA touch screen display, Bluetooth® mobile phone connection, USB connection for various iPod® models, MP3 players and memory sticks, tyre pressure monitoring, cruise control and rear parking sensors. This is topped of with electric power-fold mirrors and a reversing camera as standard. Available in the UK and across Europe, the Evora ‘Sports Racer’ adds outstanding value to the already exceptional Evora range, priced in the UK at £57,900* for the Evora with 280 PS or £65,900* for the 350 PS supercharged Evora S. For UK customers, the cost benefits are clear; by opting for the pre-packaged Evora ‘Sports Racer’ savings range from £6,450 to £7,150 respectively. This year Team Bullrun won the title in the MSA British Endurance Championship in the newly developed Evora GTC and Alex Job Racing has been enjoying success in the ALMS series with the Evora GTE. Meanwhile, the Evora GT4 has been racing successfully in the Brazilian GT, the Iberian Supercar Trophy, Campeonato de España/IBER GT, Cameonato de Portugal GT, the Dutch GT championship and 24 hour races in Dubai, Barcelona and at Silverstone. The Evora GT4 is also competing in Lotus Cup series across the globe. Results show a total vehicle mass reduction of 31% (528.3 kg or 1,162 lbs.) and a $239 (£150 / €188) saving in overall vehicle cost. Body structure utilises advanced materials including high-strength steels, aluminium, magnesium and composites along with high tech joining and bonding techniques. Following on from Lotus’ successful “Phase One” study, published in 2010, which looked at the empirical and theoretical weight saving for a standard CUV, Lotus Engineering conducted further research to confirm if a lightweight and commercially feasible body structure has the potential to meet or exceed the requirements for size, luggage volume, comfort, crashworthiness and structural integrity. Lotus Engineering’s “Phase Two” body structure design was based on the dimensions of a 2009 Toyota Venza CUV and utilised advanced materials such as high-strength steels, aluminium, magnesium and composites along with advanced joining and bonding techniques to achieve a substantial body and overall vehicle mass reduction without degrading size, practicality or performance. The body mass was reduced by 37% (311 lbs. or 141.6 kg), which contributed to a total vehicle mass reduction of 31% (1,162 lbs. or 528.3 kg) including the mass savings of other vehicle systems (interior, suspension, chassis, closures, etc.) that had previously been identified in “Phase One”. The detailed Computer Aided Engineering (CAE) analysis undertaken indicated that a 31% mass-reduced vehicle with a 37% lighter Body-in-White (BIW) structure has the potential to meet U.S. Federal impact requirements. This includes side impact and door beam intrusion, seatbelt loading, child seat tether loadings, front and rear chassis frame load buckling stability, full frontal crash stiffness and body compatibility and frame performance under low-speed bumper impact loads as defined by the Insurance Institute for Highway Safety (IIHS). The result is a BIW design with a 20% increase in torsional stiffness over the class leading CUV. Although the significant mass savings in the BIW design results in an increased BIW cost of $723 (£456 / €568), the overall vehicle cost is reduced through savings of $239 (£150 / €188) identified across the whole vehicle and when manufacturing and assembly costs are included in the analysis. A significant reduction in the parts count from 269 to 169, achieved by an increased level of component integration, also helped offset the increased BIW piece cost. In April 2010, Lotus Engineering concluded the first phase of a study which substantiated that a reduction in vehicle mass could be achieved for medium production volume vehicles (approximately 50,000 units per year) with a 23% reduction in fuel consumption. In September 2010 the California Air Resources Board (CARB) commissioned Lotus Engineering to initiate Phase Two of the study and take a deeper look into the future of lighter, more efficient vehicles manufactured using lighter yet stronger materials. When Lotus founder Colin Chapman coined the phrase “performance through light weight” he was referring to much more than mere accelerative performance. In the broader sense he meant that a lighter vehicle does everything better, including being more fuel efficient. Over the past 60-plus years, Lotus road and racing vehicles have consistently benefited from this core philosophy and Lotus has developed a strong reputation as a leader in lightweight vehicle technologies. After decades of most manufacturers building increasingly heavy, feature-laden cars, now the very aggressive corporate average fuel economy (CAFÉ) standards increasing from a target of 35.5 mpg in 2016 to 54.5 in 2025 have all manufacturers reevaluating the virtues of mass reduction and prioritising the materials, technologies and production methods that will enable lighter, stronger and more efficient vehicles.